Rodger (right), age 64, is HIV positive and has survived a stroke, open heart surgery, brain surgery and a heart attack. He is blind, hearing impaired and his teeth were missing or severely damaged. 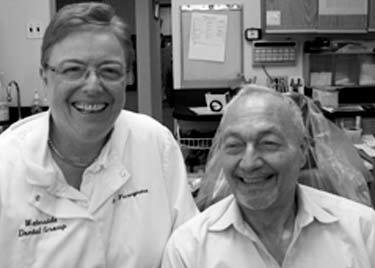 Endodontist Jeffrey Senzer, DDS, donated two root canals and Jean Furuyama, DDS, provided Rodger’s dental treatment, including upper and lower partial dentures. Regal Dental Technologies contributed the fabrications.